The 2nd International Franz Cibulka Music Competition is designed for the following ensembles: woodwind quintet, saxophone quartet, trombone quartet, clarinet quartet, clarinet quintet. The prize money will be provided by the Styrian State Government and ceremoniously handed over by one of its representatives. Additionally, the winners will receive the Franz-Cibulka-Medal as a special award. 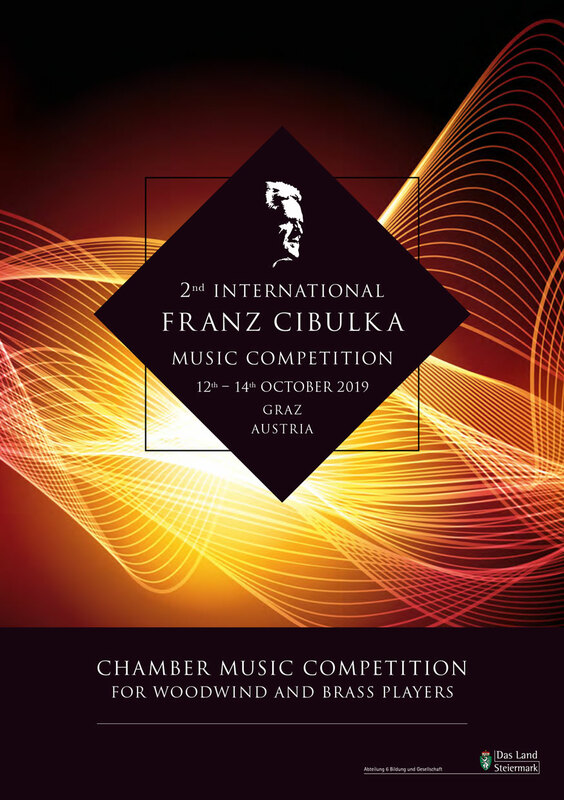 The International Franz Cibulka Music Competition aims to spread the demanding compositions of the Styrian composer Franz Cibulka (1946-2016) and support young musicians who strive for an international career. The competition changes its focus every year: Alternately, solo and chamber music interpretations of Franz Cibulka’s compositions are performed. In 2019, the competition is open to chamber musicians and in 2020 it will be open to soloists again. As the ensemble cast and solo instruments differ from one year to the next, changes will be announced in time. The chosen compulsory piece needs to be fully presented, in the first round as well as in the final. In the final of the best five ensembles, not only the compulsory piece but also freely chosen compositions have to be performed. The playing time must be in between 15 and 20 minutes. Only ensembles that do not exceed an age average of 30 years are allowed to enter the competition. No single musician must be older than 32 (born in 1987). Uncut recording (piece can be freely chosen) COMMENT: If the recording is an audio file, a video (e.g. : youtube) needs to be added. Attention: The description of the ensemble and the letter of recommendation are only accepted in German. The confirmation of admission as well as the audition dates will be announced on 15th July 2019 at the latest. The entrance fee is 150 € per ensemble and needs to be paid into the following account by 1st June 2019: Styrian Brass-Band Music Association (IBAN: AT40 3800 0000 0448 8011, BIC: RZSTAT2G). As soon as the confirmation of admission has been received, payment cannot be refunded in case of the ensembles’ inability to appear or refusal to take part in the competition. However, the payment will be refunded if the competition committee rejects the ensemble. The competition is held in Graz from 12th – 14th October 2019. The first round takes place on 12th and 13th October 2019 in the Fux-Hall of the Johann-Joseph-Fux-Conservatorium, Nikolaigasse 2, 8020 Graz. The final and the following award ceremony are scheduled for 14th October 2019 at 7 p.m. (Minoritensaal, Mariahilferplatz 3, 8020 Graz). Both the first round and the final are open to visitors. Queries regarding the invitation will only be answered via email cibulka-competition@stmk.gv.at zu stellen.